His name, Metropolitan His Grace Mathews Mar Barnabas, fits him ever so perfectly, because of his fervor to propagate the Holy Gospel of the Lord. He went where others hesitated to go and puts his heart and soul to live his divine call. His austere and simple way of life always earned him immense respect from every one who meets him. He has only one shepherd. His humility is such that he never holds on to the high esteem of "Episcopacy". His needs are few and so, he is never a burden for the people whom he leads. He is extremely faithful in all financial matters of the diocese and under his leadership the parishes of the Northeast American Diocese enjoy peace and steady progress. Mathukutty (childhood name) was born in Kallarackaparampil house at Vengola, to Kuruvilla & Mariamma of the Kidangethu Thombra Family, on August 9, 1924. He is the youngest one among four brothers and two sisters. His sister, Sister Mary, was one of the founding nuns of the Bethlehem Convent in Kizhakkambalam, near Alwaye. His Grace's grandfather and uncle were Orthodox priests who were of good learning and leadership. Their earnestness to the service of the Church. and dedication to the Orthodox Christian way of life inspired the young Mathukutty. Aside from them, His Grace's mother also inspired and profoundly impacted him. She was very pious and devoted woman, who would do anything for the Church and Faith. Her uncompromising habit of fasting and love for the poor, made a deep impression in the mind of her son. He was ordained as a Deacon in 1943, and as a Priest in 1951. He studied Biology at Madras Christian College and while he served the parish in Secunderabad he did his Masters in Botany in Osmania University. He began Theological studies under the guidance of his uncle Rev. Fr. K. P. Paulose. In 1949 he joined the Orthodox Theological Seminary as a special student and studied Syriac for two years. While he was the Vicar of the Calcutta parish, he studied in the Bishop's College, Calcutta and earned his B. D. degree from the Serampore University, as an external student. His Holiness Catholicos Baselios Gheevarghese II ordained him as a Deacon in 1943, at his home parish, St. Thomas Cheriapally, Thuruthipaly, Vengola. In 1951 Metropolitan Augen Mar Thimotheos (Later Catholicos), ordained him to the Holy Priesthood. It was in 1977, that the Malankara Association elected Rev. Fr. 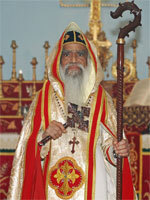 K. K. Mathews as a Metropolitan of the Church. On May 15, 1978 His Holiness Catholicos Moran Mar Baselios Marthoma Mathews I, Catholicos of the East, consecrated him as Metropolitan Mathews Mar Barnabas of the Malankara (Indian) Orthodox Church. As a Deacon, he was a teacher at Kurppumpady M.G. M. High School in 1947. He taught there for two years and continued to teach for another two years at the MD Seminary High School, Kottayam, until he was ordained to priesthood. He also was a lecturer in the Orthodox Theological Seminary at Kottayam for five years. During this period (1967-1972) he was the Resident Faculty Member at the Seminary and full-time Warden. He also cherished the years when he served as Chaplain in the Kolenchery Medical Mission Hospital from 1972-1978. In the past, Metropolitan Mar Barnabas has been the Shepherd to Kottayam, Angamaly and Idukki Dioceses. Under His Grace's leadership in the newly formed Idukki Diocese, a Diocesan Center and Metropolitan's Residence were built. He led that Diocese efficiently and organized new parishes and visited the flock regularly. The Idukki Medical Mission at Nettithozhu is another significant achievement for the Church which was under His Grace's leadership. On January 18, 2011, His Holiness the Catholicos of the East And Malankara Metropolitan, Baselius Mar Thoma Paulose II, formally accepted His Grace Mathews Mar Barnabas' request to be relieved from administrative responsibilities as Diocesan Metropolitan of the Northeast American Diocese. His Grace enjoyed his retirement at the Monastery of St. Kuriakose the Martyr, lovingly known as 'Pampady Dayro'. On December 9, 2012, our beloved Vailya Thirumeni, who faithfully shepherded the flock of the Northeast American Diocese, for more than 19 years, fell asleep in Christ. His Grace was entombed at his home parish, Sts. Peter & Paul Orthodox Church, Valayanchirangara, Kerala, India. His Grace's example of love, prayer, and charity continues to reign in the hearts of his spiritual children. May his holy intercession before Christ our God, be a fortress for our Church, the Diocese, and our families. May the precious memory of our most beloved Father in Christ, His Grace Mathews Mar Barnabas, Metropolitan be eternal!